Pious tradition tells us that our Lady appeared to Saint Dominic with the rosary in the 15th Century. 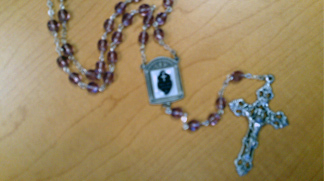 History informs us that the rosary was formed at an earlier time, over an extended period. The bottom line was to help “unlettered folk” share more in the Liturgy. A starting point was the 150 Psalms of the Hebrew Bible. Each of these was replaced by a passage about Jesus or Mary. This collection came to be known as a Rosarium (Rose Garden). These humble beginnings were rooted in the 12th Century. These passages were broken down in three sections to cover the life of Jesus: His early life (Joyful Mysteries), His sufferings and His risen life. Today, the Psalms are replaced by 150 Hail Marys. In recent history, Pope John Paul, II rightly observed that significant events of our Lord’s life were not covered by the traditional rosary. On October 16, 2002, after much prayer, he proclaimed the addition of five Mysteries of Light: The Baptism of Jesus, Miracle at Cana, Proclaiming the Kingdom, Transfiguration and Institution of the Eucharist. He did this at a most appropriate time – the closing of the Year of the Rosary. Error: Error validating access token: Session has expired on Monday, 18-Mar-19 14:16:37 PDT. The current time is Thursday, 18-Apr-19 19:33:57 PDT.